“You can easily judge the character of a man by how he treats those who can do nothing for him.” - Malcolm S. Forbes. Before my father left on his yearly trip to Florida to flee the brutal Chicago winter, he called me to his home so I could take charge of some things. I will never know his reasoning for this, nor the choice of items that he gave to me or better yet, why he didn’t give me certain other items. Did he know his fate was soon approaching? As I look back at the items that filled the entirety of my Tahoe at the time, it would appear so. 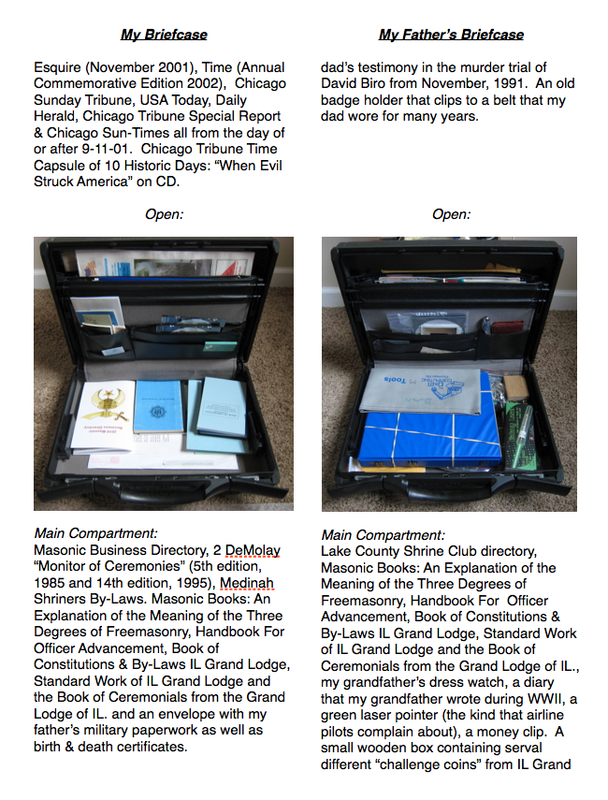 I am grateful for the items that I have of my father’s, but long for some of his personal Masonic items that one day I hope to take charge of. But this is not about the have not’s, more so it is a study of the haves. 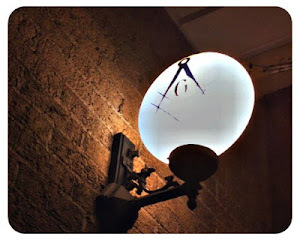 Years ago, I remember my father’s briefcase, light brown and worn leather, overflowing with papers, books and a small wooden hammer, the top adorned with Masonic emblems. As he got ready to leave the house one night, he picked up that trusted case and while in full stride towards the door, the lid popped open. Amidst the rain of papers, books and other items covering the family room, the train of words emanating from my dad about melted the paneling off the wall. I was just old enough to know to hide my laughter. Well, try too anyways. I did not seem to lend any help to my fathers situation. It wasn’t more than a few days later that I was being installed as an officer in Lakes Chapter, Order of DeMolay. As we were getting ready to leave for the Ceremony, my father pulled something out from beneath his desk. He had in his hand a brand new black Samsonite briefcase, still in the plastic wrapping. He handed me the new briefcase and told me that I will see the need for this as the years pass. I told him he needed it more than I did, as I started to relive the laughter from the other day, and as he called a smarty so and so, I noticed the exact same briefcase he was holding out to me also sat next to his desk. With one striking difference of course, his had a Shriner’s Medallion at the top center of the lid. I never put much thought into this case. I used it here and there, mostly when I served as Master Councilor of the DeMolay Chapter. It was simple, black and didn’t stand out as flashy, just the way I like it. There is a simple three digit combination and a latch at either end. One interesting characteristic of these cases was the ability to open it two different ways. 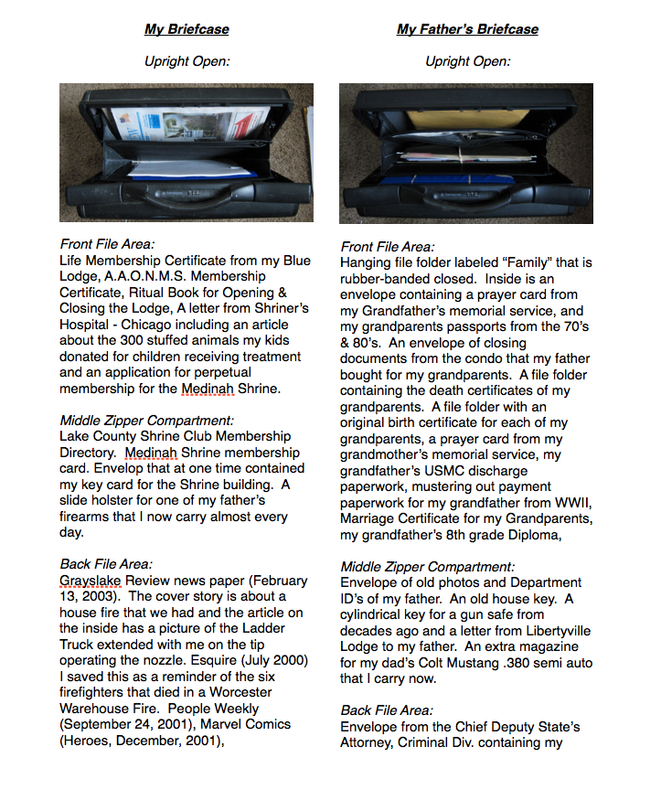 You see, if you stood it up and opened it, you could access the 2 file folders that had a shallow zippered pouch between them. If you laid the case down and opened it, you could access the main area in side the briefcase. In this position, a simple flip of a tab on either side allowed the file folder sections to come down. Pretty neat for way back then, if you ask me. 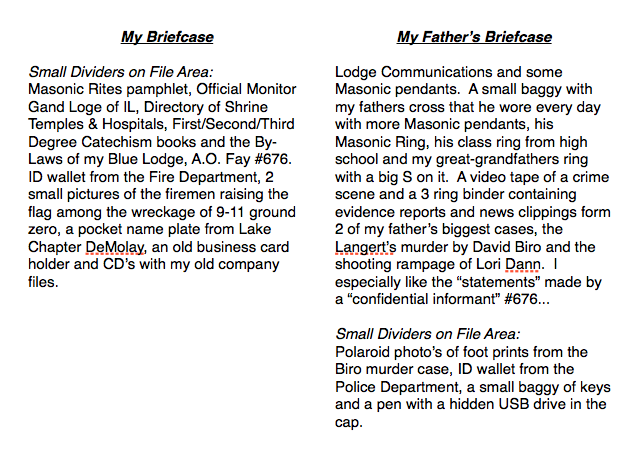 I don’t know if the contents of my father’s briefcase can truly be used as a measure of the man he was. But it sure does start to add up to something great if you ask me. My father had a way of finding some of the most obscure Masonic items like the “challenge coins” where you could engrave your initiation dates and pendants that have hidden compartments. I was happy to share some of these items with a very good friend and Brother of mine, like my father did with me. He always found the unique and bought more than one so he could share the treasure with me or others. 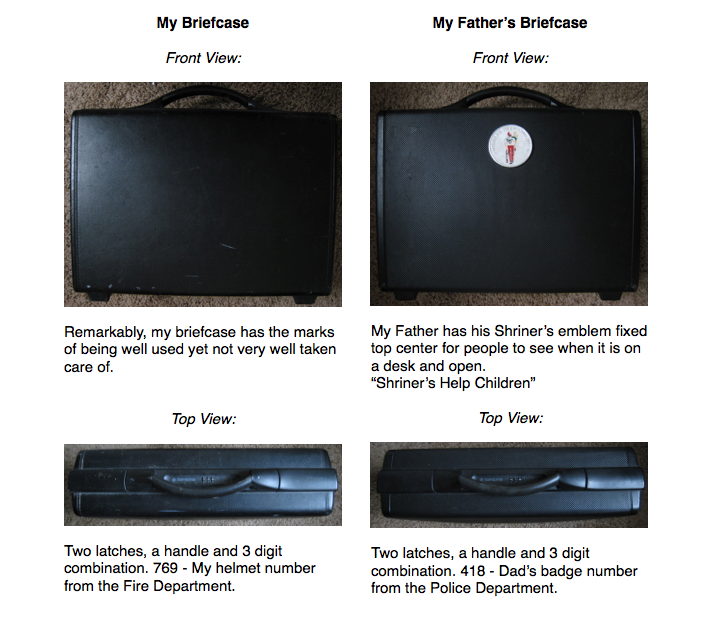 Hopefully, long after I am gone, my son or daughter can open my briefcase and remember the man I strove to be. My briefcase certainly is almost bare compared to my father’s but I also have more time to fill it with experiances. I don’t know if I can ever measure up to the men in my family that came before me: Frank, Harry, Harold or Ron, but I sure will try, for them. Also, I would hope that the Brother’s of days past and those destine to be called before I am, for refreshment with he Supreme Architect of the Universe, would be welcoming and accepting whence I am called.